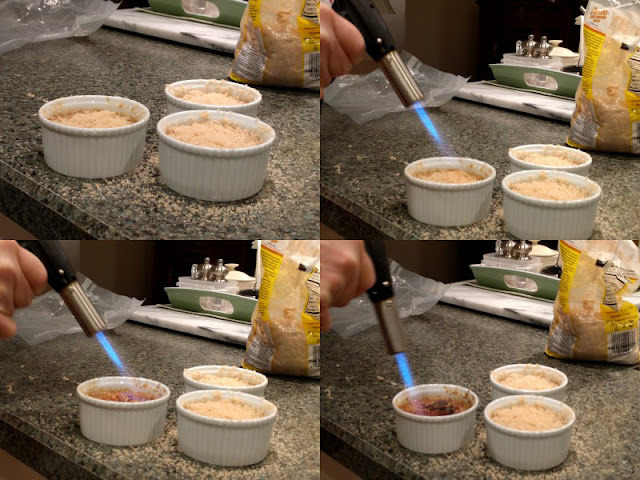 When SP & I moved in together, we discovered we both had creme brulee ramekins and torches. We decided to keep both torches and all the ramekins. I'm not really sure why we think we need 15 or so ramekins. I suppose that at the time, the rationale was that he has a large family and maybe someday for a holiday we'd make creme brulee and need all those ramekins. Eight years later, nope. Mostly those carefully stacked ramekin towers simply topple over when we get stuff in that cabinet and then we get annoyed. We have made creme brulee twice in eight years. The first time was for my parents and grandpa on Christmas Eve in 2008. 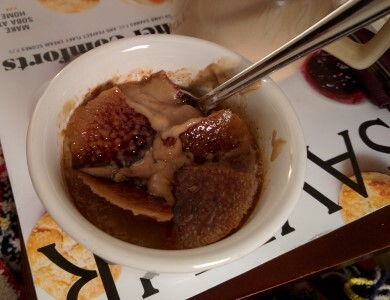 The second time was this past weekend when I wanted a "special" Valentine dessert. 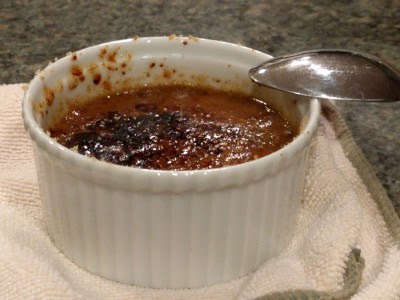 I have a lot of recipes for creme brulee, most of which we'll probably never try because it's not the sort of dessert that you want to eat very often. 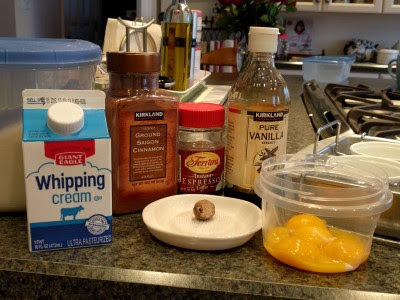 Lots of cream and egg yolks and sugar. 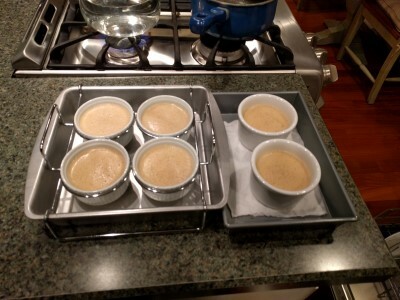 We decided to make Cappuccino Creme Brulee. I've had this recipe since the Bon Appetit March 2002 issue arrived in my mailbox. Nearly 14 years later, I'm finally trying it! 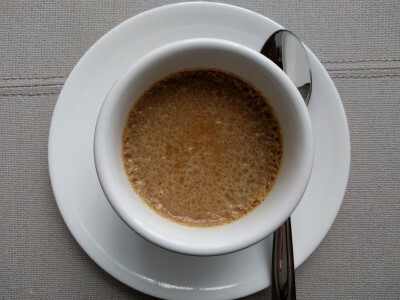 Like a tasty, frothy coffee with cinnamon and nutmeg scent. For some reason, I never get to handle the torch. SP enjoys it way too much (fire!) so I let him have his fun. The first night we used brown sugar but for the leftovers the next night, we used white sugar because it didn't involve unsealing & re-sealing a bag. I can't recall any taste/texture difference between the two torched sugars, so either is fine. 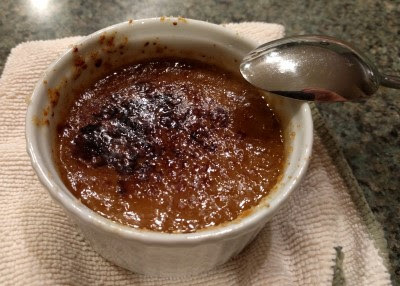 My favorite thing about creme brulee is cracking the hard sugar topping. This recipe turned out terrific. The custard had a lot of coffee and cinnamon flavor and was smooth and creamy and indulgent, It was just the right size for a little treat. We both really liked this and would definitely make it again. It was so tasty we might even make creme brulee more often.